The pressures at work can be endless. From looming deadlines to your supervisor, sales letters to send out to your most important clients, web copy to edit, presentations to develop and opinions to impress, how do you make the most of your skills, talents, experience and work ethic? How can you stand out from the crowd, and beat out your competition when it comes to that promotion? How do you know when to take risks that will pay off, enhance your creative thinking skills, and set the bar higher for yourself in the workplace, than you ever have before? Meditation for job performance can offer many benefits, including: cultivating a sense of purpose in yourself (even amid critical comments about your job performance), manage extreme stress in fast paced work environments, and even helping you increase your sales record! Meditation isn’t ‘magic’. It doesn’t offer a miracle for those who practice it, but it does act in a miraculous way for many. Meditation, which is the practice of sitting still, and emptying your mind of its thoughts, isn’t for a particular religion group of spiritual sector. It’s the art of being, doing and relaxing…for every man and woman who has difficulty handling stress in a fast paced work environment, who struggles with setting deadlines and meeting them on time; has difficult and negative co-workers to deal with, who feels as if there demanding professional life is taking over their personal life, and who struggles with ‘getting ahead’ in their career. For most employees, supervisors, managers and even the CEO, there’s one thing that they all have in common – stress. Some people may experience less stress than others, but looming deadline are inevitable, and throughout each person’s workday, there are unanticipated events, emails, and meetings that may come up. If you can’t avoid stress at work, then work with it—by meditating daily. 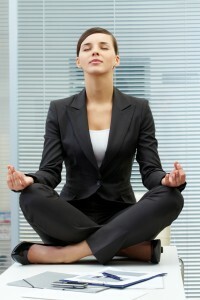 Studies have shown that regular meditation has the power to balance the mental and physical demands of a work day. 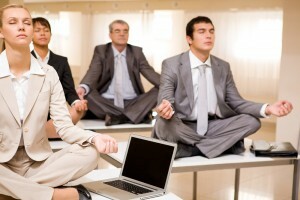 Employees that meditate together can not only bond over a more relaxed state that meditation creates, but can give many the opportunity to increase problem solving skills, and think creatively ‘outside the box’ instead of analyzing problems in the same, drab, and routinely predictable way you have always done. Meditation isn’t just about sitting, breathing and taking a much needed ten minutes away from your cubicle; it’s about restarting your battery, so to speak. Have you ever let your car run all day, only to find it hours later out of juice, and unable to get you from point A to point B? It’s run out of a necessary energy needed to sustain itself to run its best, and the same goes for you. When you treat yourself like a workaholic, and you spend day in, and day out (plus overtime) fulfilling your boss, your bosses’ boss, and the CEO with their needs (without taking the occasional ten minute break to meditate for your needs) you’ll wear yourself down, run out of battery, and eventually, stop working properly. Whether you’re a workaholic that can’t wait for the weekend to be over so you can get back to the grind, or dread every Monday morning that rolls around, your work performance matters. And in order to have a more productive, more meaningful work day – which will lead to a more meaningful and productive career – consider yourself and your needs #1. When you meditate, you have the unique opportunity to sit still, turn off the comments, criticisms and demands from everything around you, and listen to the inner workings of yourself. Then, brace the rest of your day feeling renewed, recharged and ready to show off your unique talent that no one else can match!